And as woodworkers, we also have the tools to separate us from the masses, and therefore having a potent source of fire is another degree of separation. And I needed a good flame! There are a number of sources – oxy-acetylene would have been my first choice, but you can only hire the cylinders so there would be an ongoing cost of a couple hundred dollars. It wouldn’t be a lot if it was going to have regular use, but not for the amount I’d use it for, at the moment at least. I rang BOC to see what they had in the way of kits, but all they wanted to sell were oxy-lpg sets – not what I was looking for. Bunnings had what I wanted sitting on the shelf – Primus brand fittings and hose. 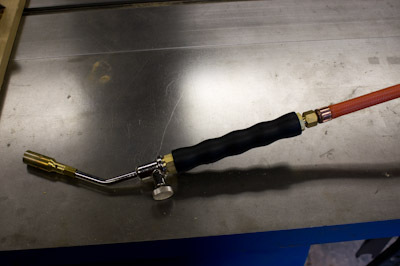 The hose to a handle, and the handle to the torch head. I tried a fine head first, but just couldn’t get it to ignite – not enough heat in the ignition source (a match), and importantly, not enough air (oxygen) being entrained into the gas flow. The medium nozzle did not have a problem igniting. 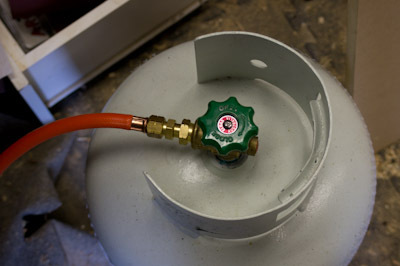 However, before firing up, I had to check for gas leaks around the fittings. 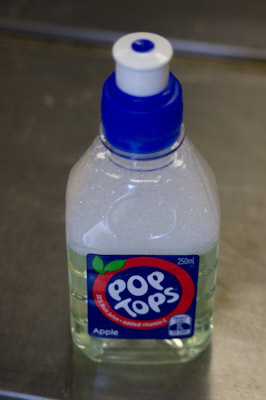 My test kit was a PopTop, with a water/detergent mix. Poured over the joints, any bubbles would be obvious. 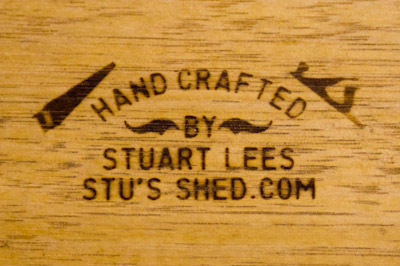 There were none, so it was onto heating up the branding iron. 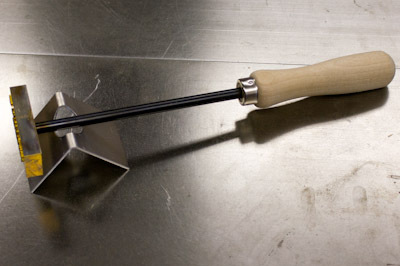 The branding iron has a wooden handle, a basic stand, and brass head. 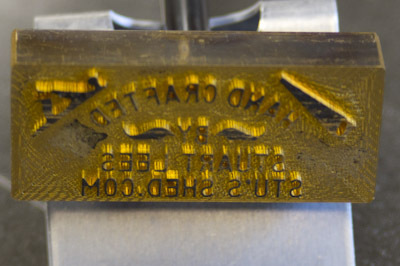 An even heating of the head is important, so as not to end up with the head warping. After a few minutes or so, a test piece confirmed the brandiing iron was ready. Works really well. I got the trigger start so it is very easy to turn on or off when you are moving between heating and burning. Replacement cylinders are about $18 for propylene (the hot one) or $12 for propane (not as hot one) ….. of course it depends on where you go (box hardware much more from memory). The unit with the propylene is around $100. Still going strong on the original gas so even though they are small they do last. Like you my first attempt was on one of the small torches which didn’t get too far!